At the beginning of World War Two TWBC set up an Emergency Committee, and within days they had opened a Communal Feeding Centre in the lounge of the Assembly Hall. It's interesting to note that they were “using chairs from Calverley Grounds. Cutlery was bought from Breeds for £27.” At this time the new Assembly Hall had just been opened and there was still a pavilion around the Calverley Grounds bandstand, which suffered bomb damage during 1940. At the time of writing there is no longer a pavilion or bandstand, and Breeds the cutlers has just closed down. As the war progressed, household food was rationed, but not restaurant food. Around the country “British Restaurants” were set up, where a 3 course, non rationed, meal could be bought for 9d. Several times TWBC EC discussed building British Restaurants, finally on November 13th 1942 the Grosvenor Recreation Ground restaurant was opened at a cost of £4,000. It was formerly opened by the Mayor, Alderman C. E. Westbrook. It was located on the site of the 1899 bandstand; if you enter by the Auckland Road gate it is the piece of grass to the right, at the very top of “The Hollow”. Reports in the TWBC EC minutes a year later are not good for Grosvenor Restaurant: the windows were repeatedly vandalised, the building was burgled twice, and was making a loss. The Restaurants were run “not for profit”; but within all Local Authorities, 73% made a profit. However, both TWBC restaurants, at Calverley Grounds and Grosvenor Recreation Ground stayed open until the end of the war. Children from St Barnabas School used the restaurant after the war as their school canteen, up until 1958. There is also a report of the boys from the Victoria School in Calverley Street using it while the old Town Hall in Calverley Road was being demolished. The building then was used as The Satellite Youth Club, and as a Montessori Nursery School. A classroom at the front of the building was the nursery, in the 1970s called “The Musical Box”, and through the 80s and 90s “Grosvenor Kindergarten”. Children remember the cold walk through the main hall to the toilets! There was a paddling pool in the garden, which was later tarmaced into a play area. The main hall was used as the Satellite Youth Club, which seems to have been very popular. There were lots of organised activities such as weight lifting, judo, CB radio club, table tennis and dancing. When it first opened there was a coffee bar with stools, and a dance floor. Later on people remember there being a “tellyroom” where you paid a penny to watch Top of the Pops. At this time there were swings and a roundabout in “The Hollow” , and summer playschemes were run that used the hall and park for organised activities. The hall was also available for private hire, and was used by Tunbridge Wells Operatic and Dramatic Society and Royal Tunbridge Wells Symphony Orchestra for rehearsals, and also used by the new Trinity Arts Centre for scenery and prop making. There were also dance classes. In 1988 a group of friends called “The Rumble Club” hosted bands in the hall, including Sigue Sigue Sputnik. After 1988 they hosted bands at several other Halls before finding a permanent base in 1992, “The Forum”. 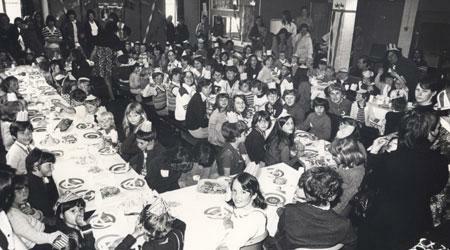 Local resident Sharon Abrams has a special memory of the Queen's Silver Jubilee: “a party was held in the Satellite Club in 1977; all the boys were given a blue commemorative mug and the girls a deep pink commemorative mug.” Sharon's photo of the party shows the hall full of tables of children with jubilee paper plates full of party food, the walls decorated with posters and streamers. In 1989 proposals were made by TWBC for the building to be pulled down. It was seen as ugly and old. Protests followed from local residents, as around 1,000 people a week were using the hall. However, finally, in 2003 the hall was demolished. It was very much a case of: “it will be sadly missed”. Fred Scales, Linda Lewis and family, David Jarvis of the Forum, Jimmy and Dan Maddock. 1 comment has been received for this page. This comment is waiting for approval by FoGH moderators.